... hoomin, I have no idea why I'm putting up with you. I want a new box. Bigger - with more room to hide in. Maybe with a separate opening to insert treats. 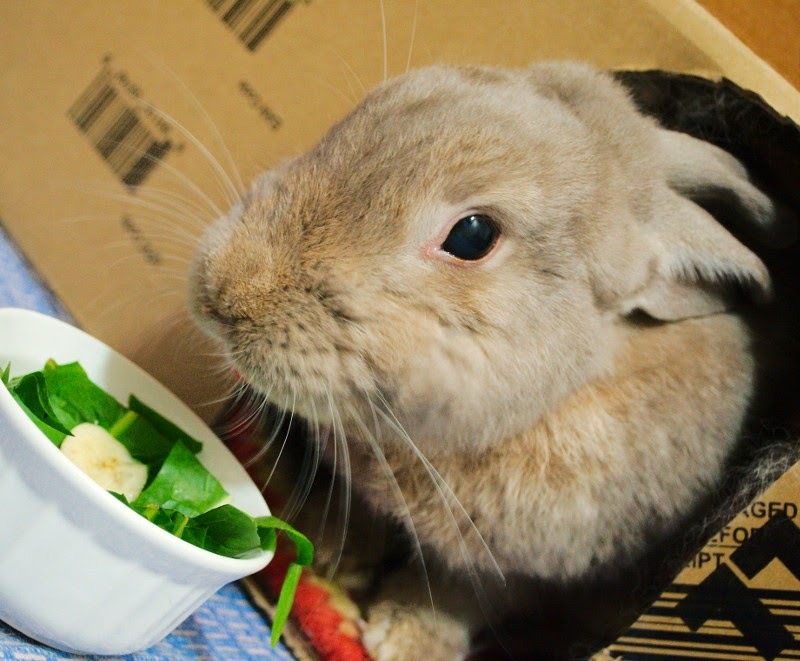 Ancient Bunny Saying: The bunny who fusses about his box will fail to notice the banana on top of the salad. Second Ancient Bunny Saying: If the question is about hoomins the answer is "banana." Or, as Gabriel Garcia Marquez wrote, "Look what happens when you give a Gringo a banana." And make it a righteous castle, not something covered with bar codes that your last Amazon shipment came in. I was greeted with the same sentiment this morning.... I guess its a welcome change from "You're late, hoomin!" Maybe someday Scarlett will be happy to see me. Meaghan, I think there is a lot of subtle happiness in Scarlett's, "You're late..." Our usual fare is, "Get out!"